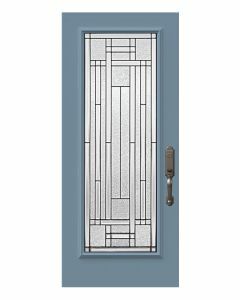 Louisbourg’s elegant geometry evokes glass etchings. The asymmetrical grid creates a striking dynamic composition. Designer's advice : looks great with Sandblasted glass. Technology : This family of products features a process which allows the application of ink on glass, making it highly decorative without compromising privacy. Frame : Frame size varies according to glass size. 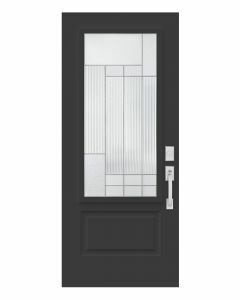 Emphasize your doorglass selection by matching it with textured glass sidelites and transom. This elegant Pure chic combinaison has a refreshing style, providing perfect harmony between your architectural style and the current trend towards simplicity. - Contemporary : Extruded PVC frame, White, UV resistant, non-yellowing, easy to paint, screw cover caps. - NovaPVC : Extruded PVC frame, White, UV resistant, non-yellowing, easy to paint, screw cover caps. - Stainable : Extruded woodgrain PVC frame, Beige, must be painted, screw cover caps. Add a second low-e pane for triple-glazing and even more energy efficiency! Add triple glazing to your doorglass to boost its energy efficiency. 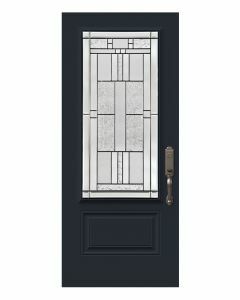 Novatech doorglass are guaranteed for 10 years against seal failure, yellowing or deterioration. See complete details of the warranty.